So…you’re in your boat, doing some fishing, and a shark jumps into your boat. No, this is not an April Fools joke. Jason Kresse and two companions were approximately 50 miles out in the Gulf of Mexico fishing for red snapper, when an 8 food mako shark jumped aboard. “All of a sudden something hit the side of the boat,” Kresse told The Associated Press on Tuesday. “He ends up landing on the back of the boat.” Kresse believes that the shark had been stimulated by the two buckets of fish guts they dumped overboard, and had gone into a feeding frenzy. The 8 foot shark aboard the 25 foot boat made for a cozy trip back to shore. 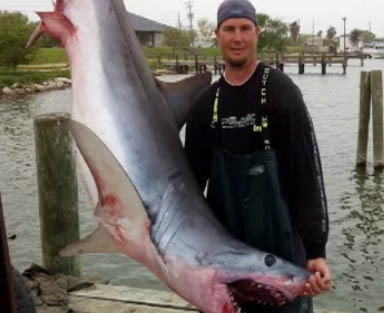 Kresse said that they were unable to get close enough to the 375-pound shark in order to throw it back into the water. Unfortunately, the shark thrashed around the board for several hours before dying. they couldn’t get close enough to toss it back off the boat but they could get close enough to kill it? are you serious? should have just manned up and tossed it back overboard with a couple of guys it could have been done.